things I learned last weekend…. I had the great fortune last weekend to be a part of what was one of the most well-publicised and delightful weddings in many a year. If I live to be 100+ I will never forget the fun, the excitement, the joy and the sheer exhuberance of the day and the people who shared it. 1) People still believe in fairytales – we love a good romance and the romance between a Prince and a Commoner still has the power to spellbind most of us! 2) Princess Diana is still dearly loved by millions of people – I heard hundreds of people speaking about her over the 2 days and many, many bloggers mention her in conjunction with their reporting of the day. 3) You don’t have to be British to be a Royalist – thousands of people travelled from all over the world to share in the day and wish this lovely couple a bright and happy future. 4) The British know how to throw a good party – all over the country people put out the tables and the bunting, blew up the balloons, cooked up a storm, put on a good bash and put the beer industry into profit for the next decade!!!! 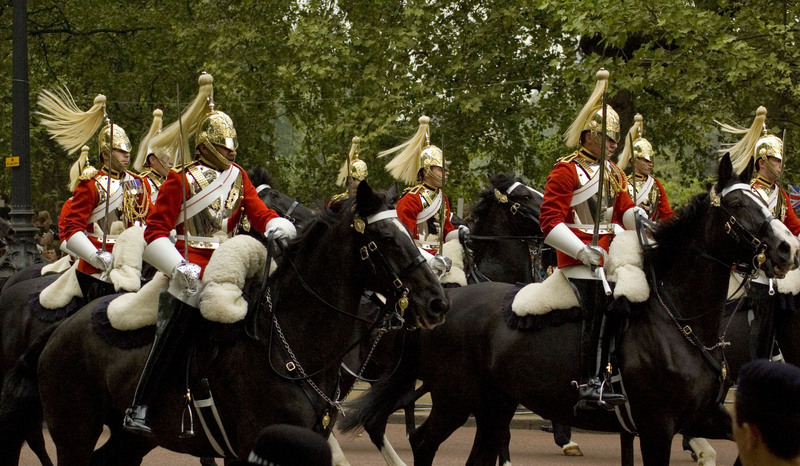 5) The British are Top of the Pops when it comes to Pomp and Pageantry – the sight of those horsemen coming down The Mall, the sound of the horses hooves on the ground was overwhelming! The sheer power! 6) There are thousands of people who truly love the young Princes – despite their priviledged upbringing and the illusion of freedom, many people are aware that they live in a gilded cage and still have their wellbeing at heart. 7) We love that Kate is such a down-to-earth lass with no airs and graces – I loved the moment she stepped out her car at the Abbey and waved to the crowd, and then when she said ‘Wow’ as she stepped onto the Palace balcony and saw the crowds. 8) I learned that people are prepared to endure the most uncomfortable of nights for a good place to view the proceedings. 9) That people are essentially honest – we left our bags outside the tent all night and no-one touched them. 10) The Mall is very gritty and with thousands of people walking by the amount of dust generated could put the Sahara to shame! 12) That people who are complete strangers are more than happy to share their worldly belongings and engage in conversation, even thought they don’t know you. 13) That even in this world of me, me, me……there are many generous people still around. 14) That the sun comes up real early at this time of the year and Buckingham Palace looks fabulous in the early morning light. 16) That I can hang on without going to the loo for 14 hours!! 17) That some people are very enterprising – the number of memento vendors I saw on The Mall the day before was entertaining! 18) That people are not afraid to dress up in ridiculous outfits and make a spectacle of themselves – bravo to all of you! 19) The words of ‘God Save the Queen’! 20) That the British on the whole are MAD…. mad/ly patriotic that is – there are many, many people in Britian who sang this lustily and with pride. 21) That they sang the National Anthem with equal pride! 22) That the Policemen on duty carry lunchpacks in little brown paper bags. 23) That my camera doesn’t work too well when its clogged with dust! 24) That pop-up tents don’t pop-down as easily as they pop-up! 25) That after only 3 hours of sleep a cup of tea tastes like nectar. 26) That despite only 3 hours of sleep from the night before, I was wide awake when the fun began. 27) I learned that I am truly grateful for my bed. 28) That my daughter is a real gem; prepared to give up her home comforts to accommodate her Mother’s mad impulses and sleep on The Mall. I didn’t sleep at all that night, I was so wired. It was amazing to take time out to celebrate joy and love and tradition in a world that seems to have forgotten all of it. I’m not a Royals junkie or a hat junkie, but I sure did love it. And Kate looks like she was born to royalty. She has such grace and bearing and charm. I so know what you mean. it was amazing to take the time out to celebrate the love and joy of a young couple on the threshold of a new life together. Kate as you say looks like she was born to the role. Graceful, elegant, lovely and charming.